Ball posting is another very basic activity for babies and toddlers. Plonking the balls in through the hole and learning how to shake them back out again is absorbing and clear containers add to the interest. Ball posting is great for playpen time and mat time, but not as good for table time or highchair time simply because the balls fall off and roll away. 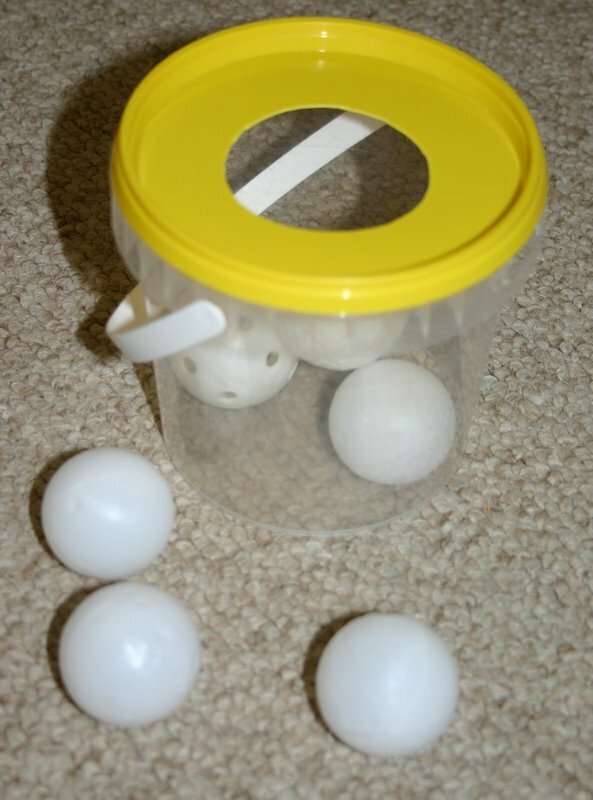 The child posts the balls through the hole and tips them back out again by shaking the container. Thank you for your site, i visit it often but have never thnkaed you for the information you share to help us provide meaningful activities for the children we care for. I am a family day care provider who loves doing proccess art with preschoolers but this year i have 3 babies 11, 12 and 13 months and a 16 month old who loves to fingerpaint. At this age everything goes into their mouths so safety is the biggest issue. What is the best age to responsibly start painting with a group of toddlers. You are welcome Shaniba, I’m glad it is helpful. As you already mentioned, until the toddlers have enough self-control not to put a paint brush and/or the paint into their mouths then they are not developmentally ready to paint. Why not give them the same experience using water and large paint brushes to paint with outdoors instead? Small brushes and a little water with a blackboard to paint onto is also a similar experience without the problem of eating paint. Water painting books (paint with water) are also great but may be a little expensive for a childcare setting.